On Thursday, naked statues of Republican nominee Donald Trump — commissioned by art collective Indecline — appeared in multiple U.S. cities, some of which were captioned "The Emperor Has No Balls." But while many people, including the New York City Parks Department, seem to have found humor in these statues, body-shaming Donald Trump in this way is completely inappropriate. He's a bigoted person who has said a number of awful things, but he is not awful or bigoted because of his body. Joshua Monroe, the artist who designed these statues under the alias "Ginger," told The Tab that Indecline had given him some guidelines for the statue, and noted that they were not meant to fat-shame Trump. "The criteria was he had to be naked, they wanted it to be pretty life-like, they wanted him to be chubbier than he is in real life, not that we were fat-shaming him in anyway, you know, he’s not that fat, and I’m not a skinny guy," Monroe told The Tab. "He had to be in a regal, presidential stance. He had to have absolutely no testicles, and he had to have a very small manhood." Whatever Monroe's intent, the impact matters more. To lead people to laugh at someone's body type and genitalia is unacceptable, no matter how terrible that person is. Laughing at these things — and encouraging others to do so — doesn't just affect Trump. It also further marginalizes intersex, trans, and fat bodies, and is definitely an act of body-shaming. Trump has certainly body-shamed people himself. But if we are trying to criticize Trump, what are we accomplishing by doing the very things we criticize him for? Once Monroe's work was publicly launched, our reactions to these naked Trump statues were what mattered. If we are staunchly anti-Trump but then laugh at Trump's body, we are compromising on our supposed progressive values to make light of something that isn't even remotely funny. One can make a concrete case against Trump based on his blatant racism, sexism, Islamophobia, xenophobia, and anti-immigrant sentiment without bringing his body into it. Trump's body is his business, even if he and his fellow presidential candidates felt the need to talk about his "small hands" during a debate on live television. Moreover, the potential impact of art always runs the risk of veering away from an artist's intent. Monroe — who used to support Trump until the nominee made fun of a reporter with a disability — was right when he told The Daily Beast that people would have criticized him for being sexist had he made a similar statue of Democratic nominee Hillary Clinton, and that would have been completely justified. 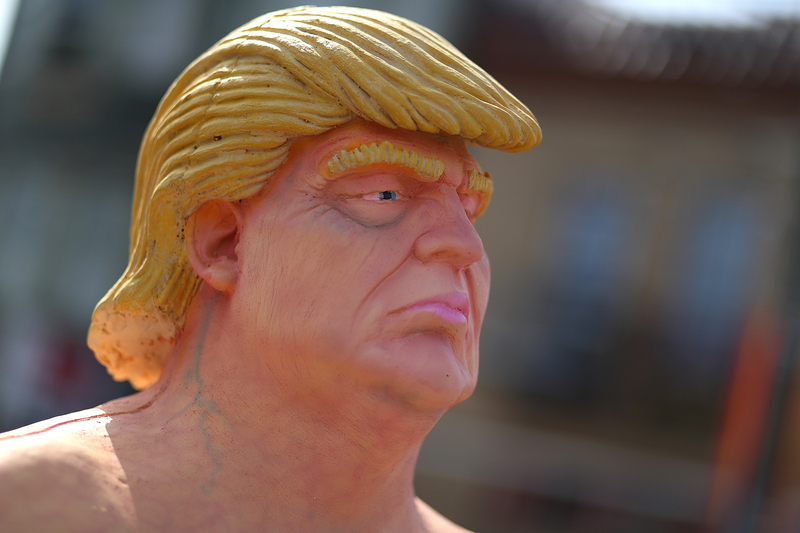 But body-shaming is always problematic and harmful, and even when it's a cis white man as offensive as Trump, shaming someone's physical appearance is still not OK. We can make a thoughtful case against him without applying his own appalling rhetoric; let's be mindful of that going forward.